This keyring, featuring the Eden 'Speak Up' pendant has handcrafted for you by the women at Eden Ministries Jewellery. These women have been rescued from lives of sexual exploitation and human trafficking. They are now free and fully engaged in creating a safe future, facilitated by their jewellery making business. The message pendant measures 2.5cm diameter. The pendant is the feature of a fashionable, bronze coloured, quality keyring. 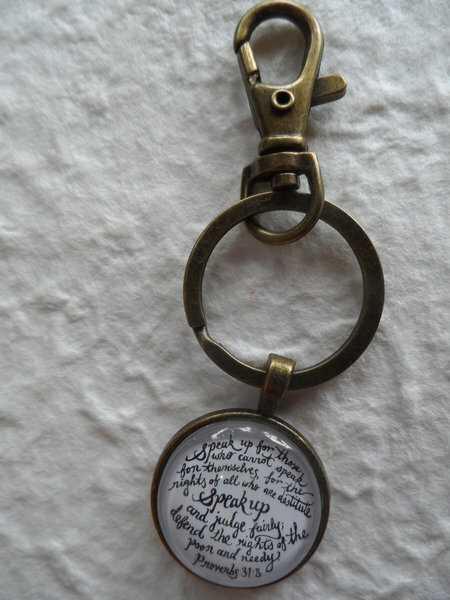 This message keyring is powerfully and attractively packaged alongside a brief story of one of the women from Eden. The 'Speak Up' message: "Speak up for those who cannot speak for themselves, for the rights of all who are destitute. Speak up and judge fairly; defend the rights of the poor and needy." from Proverbs 31:8, The Bible. Please see the other items available in the Speak Up range also.